I help you find the perfect balance between functionality and aesthetics by structuring the space, creating made-to-measure designs, highlighting it with colours and materials, choosing furniture and arranging it into the space. Here are some ways to work together. As each project is different, you can fill in the form at the bottom of this page and we will see what works best for you. On site or Online, I provide you with ideas we discuss directly to find the solutions that suit you. ● visuals created or researched during the discussion (sketches, colour palette, inspiration...) sent by email. Step by step guidance, where each choice is checked with the help of your interior architect, until you get the detailed specifications that will bring your project to life. ● discussions during the project to answer your questions, help you make your choices and discuss possible changes. The building work has now been completed and I am extremely satisfied with the result. Émilie helped me to go further in my aspirations and to make my requests come true. She always knew how to advise me and did a long-distance follow-up as complete as if we had seen each other physically. I will show you the best solution which will combine your wishes and the requirements of your daily life. ● A talk to answer your questions, clear up your doubts and discuss possible changes. 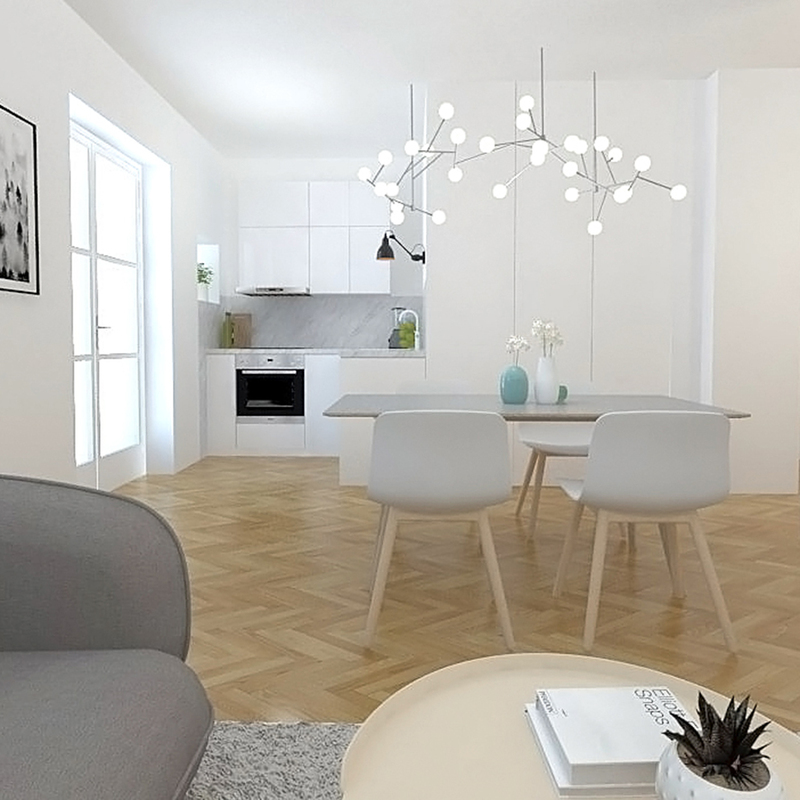 To help you attract as many people as possible, I create 3D images of a design proposal to show potential buyers what your property could become after renovation. ● Possibility of an on-site advice consultation to promote the property through decoration (without any work or purchase) - Stockholm only. Émilie has ingeniously and perfectly met our expectations, both in terms of space design and budget. The solution is both functional and aesthetic. It takes full advantage of what already exists (windows, drains, load-bearing walls, etc. ), as we had hoped: Émilie managed to turn these constraints into advantages. We look forward to the building work! Whatever help you need, and before any commitment, we will start with an initial call to get to know each other, review your needs and define the best service for you.